The Blueshirts – fascism in Ireland? This is a discussion on Near Fm’s History Show of the Blueshirts and fascism an anti-fascism in 1930s Ireland. Presented by Cathal Brennan and John Dorney and featuring historians Fearghal McGarry and Brian Hanley. We discuss; The context of fascism and the collapse of democracies across Europe in the 1920s and 30s. The Irish Civil War and its legacy. Were the Blueshirts really fascists? How is the Blueshirt period remembered today? The History Show Episode 7 – The Blueshirts. Here is an introduction to the Blueshirts. By John Dorney. Pictures of Irish politics in the 1930s look disturbing. Seried ranks of the main opposition party, in quasi-military uniform, giving the fascist stiff-armed salute. The election posters from the Irish Free State in this era also appear to show a country on the brink of another civil war – a repeat of 1922-23 conflict but this time with the European rhetoric of fascism versus of communism. Cumann na nGaedheal posters urge voters to keep out the supposedly dangerously radical Fianna Fail – “we want no red on our flag”. 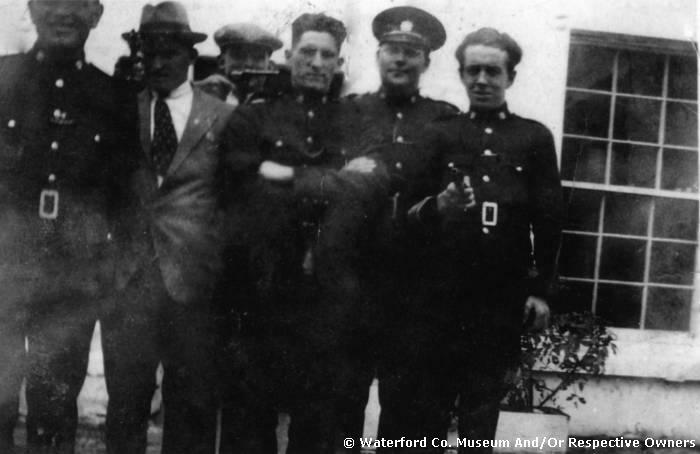 Following Cumann na nGaedheal’s defeat in the 1933 election a section of the Pro-Treatyites formed the Army Comrades Association, later christened the Blueshirts – headed by charismatic former Garda commissioner Eoin O’Duffy – to uphold social order as they saw it from possible Republican terror. At the top of the organization, a number of its leadership notably O’Duffy himself, were avowed admirers of European fascism and vocal opponents of democracy. This was at a time when European democracies, under the strain of the world economic crisis, class strife and conflict between right and left were falling like dominoes. 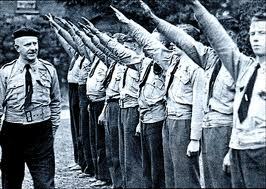 Adolf Hitler’s Nazi Party had come to power in Germany in the same year. The IRA – at this time loosely aligned with Fianna Fail, and from whose ranks the party had largely emerged in 1926 – was legalized by the Eamon de Valera government and its members began attacking Cumann na nGaedheal and Blueshirt rallies under a slogan of, “no free speech for traitors”. It appeared as if physical revenge for the republicans’ defeat in the 1922-23 civil war was a real possibility. The mostly conservative militarist leadership of the IRA in 1919-1923 would have been surprised to see the organization accused of being communists, but by 1933 that generation of leaders were mostly dead (like Michael Collins, Liam Lynch and others killed in the revolutionary period) or at the centre of mainstream politics like Richard Mulcahy and Frank Aiken. In the intervening years an influential faction in the anti-Treaty IRA grouped around such people as Peadar O’Donnell had indeed shifted the organization to the left, believing that a fully independent Irish Republic would not emerge without the embrace of social revolution. Fianna Fail itself built its political support based not only on undoing the remaining ties of the Irish Free State to Britain but also of house-building, job creation and setting up state-based Irish industries. Another dimension to the tension came when Fianna Fail stopped paying Land Annuities to Britain – a long standing national debt based on the subsidies used to buy out the old Landlord class in the Wyndham Act of 1908. Britain in return placed heavy tariffs on imported Irish beef – thus hurting the strong farmers who had been the mainstay of pro-Treaty politics since 1922. The Blueshirts, who had in the region of 30,000 members, resisted paying local rates and the land annuities (which Fianna Fail continued to collect) to the de Valera government. O’Duffy also led violent resistance to the Fianna Fail’s government policy to seize unsold cattle and to distribute the meat to the poor. In one such confrontation in Cork, a young farmer’s son and Blueshirt, Michael Patrick Lynch was shot dead by Broy’s Harriers – a republican auxiliary to the police. 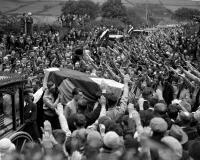 His funeral was a spectacular Blueshirt show of strength, complete with Roman salutes and military drill. There was no second civil war. The Army and Garda despite their roots in the Free State forces of 1922, obeyed the new government. 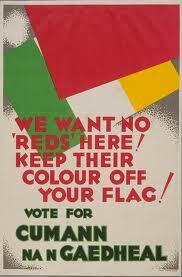 Talk of a military coup in 1933 by O’Duffy and others in Cumann na nGaedheal and the National Army came to nothing. But there was extensive rioting around the country between the rival factions of the Blueshirts and the IRA and a number of deaths on both sides. Initially at least, O’Duffy’s apparent ability to mobilise thousands of Pro-Treaty supporters made him wildly popular among demoralized Cumman na nGaedheal supporters and he was made head of the new party, Fine Gael, which was formed from a merger of Cumann na nGaedheal and the National Centre Party and the Blueshirts, or as they were calling themselves by then, the National Guard. However, his star was already waning. He backed down from a proposed March on Dublin (in imitation of Mussolini’s March on Rome in 1922) and his subsequent radical rhetoric – talking of bringing down Irish democracy but also invading Northern Ireland – saw him ousted as Fine Gael leader by more moderate voices led by WT Cosgrave – who subsequently reaffirmed the party’s loyalty to democratic and constitutional principles. The Blueshirt movement also split, with the majority following Ned Cronin into the Fine Gael-aligned so-called League of Youth and a radical minority following O’Duffy into a more openly fascistic ‘Greenshirts’ or National Corporate Party. By 1935, the most radical voices on both sides had been marginalized. De Valera banned both the Blueshirts and then the IRA. It soon became apparent that despite its populism, Fianna Fail was not in fact a vehicle for either social or Republican revolution. In 1935, de Valera worked out a deal with Britain to lower tariffs on Irish cattle and in 1938 agreed to pay off 10% of the remaining Land Annuities so that the trade in cattle could be resumed as before. In 1936, elements of both the left Republicans – by now the Republican Congress – and many former Blueshirts under O’Duffy, went to fight on opposite sides in the Spanish Civil War – that great symbolic battle between fascism and anti-fascism. Today it seems barely credible that Fine Gael, today the centrist party of government, has its roots in a quasi-fascist movement or that Fianna Fail, who provided rather conservative government for most of the 20th century, could have been perceived as social revolutionaries. At one level, the Blueshirt scare of 1933-35, represented the last gasp of a traditionally Irish pattern of the 19th and early 20th century political faction fighting – Home Rulers, Sinn Feiners, All For Ireland Leaguers, Unionists and others had been brawling it out in the streets for decades at election times. It can also be seen as the last spasm of civil war violence left over from 1922-23. Some political heirs of the Blueshirts argue that they were simply defending free speech from republican intimidation, much as did the pro-Treatyites in 1922. But Ireland was in European terms unusual in remaining democratic in the turbulent interwar period. The Blueshirts had, at their head some leaders with real anti-democratic convictions. Perhaps we should not take the peaceful resolution of Fianna Fail’s coming to power for granted. Written by: John_Dorney on 18 May, 2012.on 24 October, 2018. 12 Responses to "The Blueshirts – fascism in Ireland?" There is an assumption here that the March to Stephens Green was an attempt to seize power . Whilst commonly asserted elsewhere there has never been a shred of evidence presented to support this Fianna Fail claim . In fact the proposed march was simply the annual march and commemoration which occurred each year for Michael Collins and Arthur Griffith . This was an already well established pro treaty event. It’s a pity Dev is not around today so. We have our own fascists i.e Sinn Fein. Nobody seems to be able to stop Gerry and his merry gang. They confuse Nationalism with Republicanism and think the world began in 1916. Moreover, the fascist nature of the Blueshirts could do with more fleshing out here in fulfilment of the opening question “Were the Blueshirts really fascists?”. Unfortunately the article didn’t really delve into this. Has anybody actually studied fascism in 1930s Ireland? I’ve just finished reading Dónall Ó Drisceoil’s superb biography of Peadar O’Donnell and have a good idea of the socialist-republican side of in the 1930s, but has anybody done a study on the fascist side in the same period? Aodhan the article is only intended as a primer to the audio discussion where we discuss the fascism question in depth. Have a listen. My grandfather fought in Spain for Franco. Ciaran, Your grandfather and his pro Franco friends, did not fight in Spain, they were brought home surplus to requirement, by the Fianna Fail government of De Valera. It was the International Brigades who did the fighting against Franco.